Most people learn early in their lives not to try to put a round peg into a square hole. Coaches and leaders should keep this principle in mind to ensure their guidance fits the person and the situation, rather than a cultural stereotype. To understand how this principle applies to coaching women and men at work, in 2011 the authors collaborated to see if male and female leaders really had different approaches to work. They conducted a meta-analysis and pattern analysis of their two distinct approaches to measure how women and men think at work. The results indicate that male and female leaders have both similar and different approaches to work — but not in ways consistent with the cultural stereotype of men being strategic and task-focused and women being nurturing and people-focused. Despite the last 30 years of equal opportunity and an acceptance of the need for diversity in the workplace, stereotypes are alive and well. In the May 18 Wall Street Journal article “How Women Can Get Ahead: Advice from Female CEOs,” several CEOs countered advice from former GE CEO Jack Welch. He suggested women’s affinity groups and formal mentoring programs are unproductive avenues for advancement. He recommended that women only focus on results. Several female CEOs responded that results are only part of the success formula. The results of the aforementioned meta-analysis agree and suggest the old views must be expanded. In today’s business environment, stereotypes threaten productivity by wasting talent. The meta-analysis viewed men’s and women’s actions and decisions in organizations from two perspectives: a leadership decision priority basis, and an organizational and strategic viewpoint. The leadership assessment, Leadership Spectrum Profile (LSP), measures individuals’ current business goals and priorities and was based on more than 4,900 respondents. The organizational alignment assessment, Measuring the Alignment of People and Processes (MAPP), has been administered to more than 1,300 respondents globally. Women represented 45 percent of the LSP database and 47 percent of the MAPP respondents. Each database is an accumulation of the assessment results from participating companies starting in 2000 for the LSP and 2003 for MAPP. First, coaches should not rely on false gender or leadership stereotypes, which are narrowly focused and single dimensional. They need to base their knowledge on studies that reveal the complexity of people. The meta-analysis of the LSP and MAPP is intended to help coaches and executives by providing a broader, research-based set of findings that reveal some of this complexity. These findings help coaches take a closer look at men and women’s business priorities, mindsets and behaviors. 1.All business leaders, regardless of gender, have many commonalities. 2.Leadership has broadened and changed from the 20th century model. 3.A new paradigm of leadership, particularly for women, is emerging. Coaches must remember, regardless of their gender, the women and men they coach have much in common with each other as well as some valuable differences. Both the LSP and MAPP assessments identify that both genders are very business focused, with a clear understanding of the strategic and operational issues that confront their organizations. Both assessments also reveal that the difference between women and men in organizations is one of emphasis within a shared perspective of the organization’s mission and strategy. Specifically, the data from the LSP found that men and women were, first and foremost, business people, and tend to focus on six areas (Figure 1). The top two priorities show both male and female leaders are focused outward on markets and their organizations’ customers. The third and fourth priorities are inwardly focused on effectiveness and financial return. The final priority returns to an outward look, the search for opportunity in the marketplace. MAPP results showed a similar pattern. This finding is important because the two assessments have different focuses. The LSP is designed to have respondents understand their own leadership priorities. In contrast, MAPP is designed to reveal the underlying drivers of organizational performance, and therefore assess the collective perspective of men and women. Despite the differences in the instrument’s focus, patterns — as shown in Figures 1, 2, 3 and 5 — show male and female leaders approach business issues with a common perspective. Welch was correct to suggest that performance counts. Yet, to produce results today requires a broader and more comprehensive mindset toward a leader’s role. To teach others to be effective, coaches have to broaden current mindsets, rather than reinforcing old labels. A first step in that process is to understand the commonalities of business leaders. Both databases show men and women are business focused, with a mutual understanding of the strategic issues that confront their organizations. Whatever a leader’s gender, all respondents were business people first. They know their companies’ strategies, markets, value propositions and competitive advantages. At work, business leaders are more alike than not. But there are some intriguing differences. The results from MAPP show men and women disagree on some, though not all, priorities. 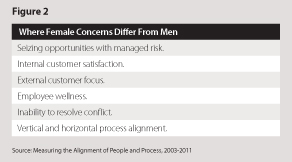 From both an organizational and strategic perspective, women are more concerned than men with six areas (Figure 2). Executive women were more inclined to see and take strategic opportunities with managed risk. This tends to go against gender stereotypes, but it fits together with the finding that women tend to be more focused on external customers. Paying close attention to their customers means seeing new areas of opportunity where managed risk can lead to growth. Perhaps this helps explain why Fortune 500 companies with a higher representation of female board directors attain higher financial performance, on average, than those with lower representations of female board directors. But getting companies to share their level of customer focus and risk tolerance may be an uphill battle. The MAPP results also show that women report less agreement with their company’s existing operating philosophies than men do. They’re more likely to say that they must work around their company’s bureaucracies. When combined, results of the two studies challenge the old stereotypes. The studies identified that executive women were more inclined than men to see and take strategic risks and seize opportunities. The women also were focused more on external customers and realities than internal issues. Women tended to concentrate on three priorities (Figure 3). The results suggest that women are more likely than men to promote change to meet evolving business opportunities. MAPP results found that women were more interested in alignment and conflict resolution while the LSP indicates women are more focused on making structures and systems more effective. Women tend to target two externally focused priorities — meeting customer needs and scanning the environment. Men tend to target just one external priority — developing new products and services. Therefore, the results suggest that men tend to be more singularly focused than women. Women’s greater emphasis on priorities, consequences and alternatives may make them appear less decisive than men. The advantage of the traditional gender and leadership perspective is that it paints a simpler model of how men and women think and operate in the workforce (Figure 4). As opposed to the traditional model, these research results find that women and men operate from similar mindsets but with different areas of emphasis. Their mindsets are complementary, reducing team and organizational blind spots and unintended consequences. The two studies show that differences between female and male leaders are much more subtle than indicated in the traditional model (Figure 5). Coaches and leaders need to comprehend these differences to gain a more complete understanding of those they advise and to understand organizational diversity and changing leadership requirements. The most successful leaders use different perspectives and integrated mindsets as the springboard for their success. Leaders who can blend all of these perspectives will bring out the best in their direct reports and build stronger teams. They will be able to reduce shared blind spots, find hidden blockages and discover more opportunities than those who work from the traditional gender model. 1. Examine the aforementioned identified major business priorities. These concepts such as internal efficiencies, process improvements and external customer satisfaction are designed to keep everyone on the same page and targeting real business issues. These topics are the start for any executive coaching recipient. Everyone has them in common, and all can exchange opinions about them and build the rapport that is essential to effective coaching relationships and organizational leadership. 2. Take advantage of different points of view, and recognize that adaptability is critical. Coaches and leaders should ask their coaching recipients to give their point of view on customers, managed risk or internal inefficiencies, and listen closely to their realities. Coaching recipients need to build on their natural strengths, stretch their minds and see several paths forward. Coaches who apply traditional gender stereotyping may harm those they coach and the organizations they serve. They unwittingly reinforce how men and women should think and suppress individual and organizational growth. Views vital in the competitive 21st century may be ignored to the detriment of all. By understanding that the men and women they coach will have a variety of different strengths and perspectives that differ from the traditional model, coaches can help uncover unheard views, encourage both genders to put forth their perspectives and demonstrate the value of diversity. Mary Lippitt is founder and president of Enterprise Management Ltd., a leadership development consultancy. Miles H. Overholt is the principal of Riverton Management Consulting Group. They can be reached at editor@diversity-executive.com.